XP8 began in 2001 as a trio including previous singer Paul Toohill. Melding an airy blend of EBM, electronica, techno and trance, the band brought their various visions and talents to life with synthetic vibrancy and danceable beats, while crossing electronic genres with relative ease. After having released their first demo, Forgive, on the now defunct mp3.com website, and receiving good feedback, XP8 signed a deal with the Polish label Black Flames Records. The demo was reissued in May 2004 as Forgive[n], quickly followed by the RE_Productions EP in October. A year later, XP8 signed to Infacted Recordings in Germany to release their sophomore effort, Hrs:Min:Sec, which the band considers their real debut. Over the years that followed, XP8 made a name for themselves due to their energetic live performances and their much sought-after remix work. Their third studio album, The Art Of Revenge, was released in January 2008 and immediately received rave reviews, and was subsequently licensed in North America to Sigsaly Transmission Media and in Russia to Gravitator Records. 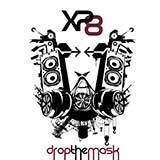 Summer 2008 saw XP8 undertaking their first US tour with System Syn where they were enthusiastically greeted by rabid fans from New York to Los Angeles and everywhere between.